African American skin discolorations may be caused by underpigmentation or hyperpigmentation of the skin. The results are patches that are either lighter or darker than the person's natural skin tone. Although most skin discolorations are not exclusive to African Americans, they are more noticeable in people with darker skin tones. Hyperpigmentation is usually evident in skin that has been damaged by acne or other scarring. After the acne or other scar has healed, darker shades appear, due to the melanin in dark skin, according to the American Osteopathic College of Dermatology. Melanin gives skin its color. Hyperpigmentation is one of the most common complaints of African American skin discolorations, but it is a problem that may be evident in any race. Hyperpigmention can cover small or large areas of the skin. Dark spots in skin are also commonly called freckles or age spots. Age spots are the result of hyperpigmentation in areas of the skin that have become darker due to the sun, but genetics may also cause a person to be prone to having age spots. The Mayo Clinic states that age spots can simply appear over time as a person grows older. Freckles are also the result of hyperpigmentation in African American skin. Freckles, though, are more visible in African Americans with lighter skin tones. People may be born with freckles or they may appear due to sun exposure. Freckles differ in appearance from age spots, because they are typically a series of tiny spots that are clumped together. Like age spots and other hyperpigmentation issues, freckles can sometimes be lightened with chemical fade creams or natural remedies, such as lemon juice. Hyperpigmentation may be treated with chemical fade creams, peals, or items such as fruits or herbs with natural fading properties. Vitiligo is the opposite of hyperpigmentation, because it is a problem that results in losing one pigmentation in the skin. According to the Mayo Clinic, vitiligo is the result of dying melanin cells in the skin. In darker skin, the skin will appear to be a lighter color than one's natural color. Vitiligo is more noticeable in people with darker tones, but anyone can have vitiligo. It may begin in small areas and then spread to larger areas. The Mayo Clinic reports that there is no cure for vitiligo. Mongolian spots are a type of birthmark that are prevalent on African American skin. The birthmarks are usually brown or bluish, and they may resemble bruises in African American skin, according to Dr. Alan Greene, M.D., FAAP. The birthmarks are caused by melanin and may have different tones, according to the spots' location. Because they resemble bruises, it can be easy to mistake them for marks that are the result of abuse. Mongolian spots may fade, but Dr. Greene reports that they can be permanent if a person has the spots after they have reached puberty. When extra scar tissue forms on an issue, a keloid is created. 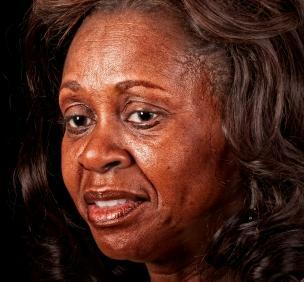 Keloids are more common in African Americans and people with darker skin, and hyperpigmentation on the keloid can result in skin discoloration. Keloids usually have a ridged, bumpy appearance in the skin. Some keloids have the appearance of noticeably raised skin. It is possible to get keloids due to minor skin problems, like adult acne. Keloids may also be formed after a piercing or a bite. Keloids are not dangerous but can change a person's appearance. Keloids may be treated with silicone. Doctors may place silicone over the infected area to try to smooth the keloid out. Some keloids may be surgically removed, but there is a chance that the surgery will make the infected area look worse than the original keloid. Discoloration may be treatable; it is always wise to consult a physician for advice and treatment options involving skin discoloration.